Learning how to make a card is fun! 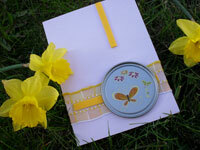 For one thing, handmade cards offer a great opportunity to show you care. They will also save you money, since it cost far less to make greeting cards than it does to purchase them. Everyone should know how to make a card... so I'm about to share with you the best card making technique to get you started right. It's a really simple concept, but if you've never made your own greeting cards, it might be a card making tip that's new to you. Whether you NEED to make a card because you're on a budget... or you WANT to make a card because you hope to share some thoughtfulness and creativity, I hope this easy card making tip will get you started right. After you make a few card blanks, here's a few card making ideas that don't require expensive card making supplies to make. 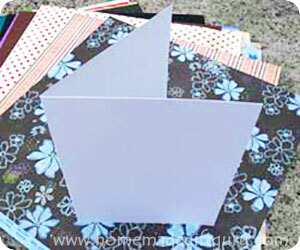 Card blanks are a quick and easy way to get started with card making. In fact, I enjoy using card blanks so much that I almost always start my card making projects with one. The purpose of this page is simply to point out the benefits of using a card blank as a foundation for cards and to provide some helpful tips for making them. You can make basic card blanks (basically just a card stock cut to size, scored and folded in half) or you can make fancy card blanks such as accordion folded card blanks or card blanks with each side folded to the center (like double doors). Card blanks are great for kids not just adults. Starting your kids off with card blanks makes it easy for them to learn and experiment with how to make a card. Choose Paper. Choose a heavy card stock, preferably in a light shade such as white, cream or lilac. Note: The heavier the card stock, the sturdier your card will be. Light shades, especially white, allow easy writing inside if you choose to write a personal message. Cut Paper. Cut your paper twice the width of your finished card to create the front and back. Score Paper. Score paper before folding. Using a ruler for a guide (press ruler down firmly), run the tip of a bone folder or even the blunt top of a butter knife or empty ball point pen across the paper where you plan to fold it in half. Note: The resulting ridge ensures that the paper folds evenly and does not crack along the outer fold. ... In other words, the indentation will be on the outside and the thin line of paper protruding will be on the inside. (It seems backwards but this prevents cracking due to the stress of stretching). That's how to make a card blank. 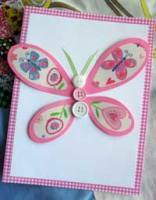 You can also try other shapes and other ways of folding your base for more fun handmade card ideas using this basic card making technique. This handmade card idea is so unique... and no fancy card making supplies needed!